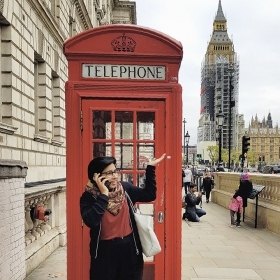 Sidikha Ashraf ’19 found that her time at King’s College in London helped her better understand her South Asian American identity. What are you studying at King’s College? I’ve been really involved in the KCL Islamic Society on Campus (ISOC). I participated in their famous Charity Week, where university ISOCs from around the world raise money for children in need, while also competing against each other to see who raises the most. The grand total raised by all the ISOCs that competed across the globe was £1,169,285.48 [$1.6 million]. Besides that, I’ve mostly been sightseeing. What has surprised you most about British life? So many lanyards. Almost everyone is wearing one, and no one feels dorky about it. The girl with the BBC anchor voice in one of my classes even bedazzled hers. My social medicine class had a lecture just about “suffering,” and two of the case studies were set in India. Being a South Asian American woman who wasn’t taught much about partition or anything really about South Asian history, it’s been emotional learning some things for the first time. I did a lot of self-research after that class and have been going to exhibits in London focusing on South Asian history. For example, I recently went to an exhibit on Ayurveda in the Wellcome Collection. Every new fact and story about colonialism or being South Asian, I’m just absorbing. It’s all been helpful for further understanding my identity.